How can you step in your customer’s shoes? We’d like to tell you a story on how to understand your customer’s needs, identify development opportunities and as a result increase your company’s income by creating a Customer Journey Map. Success of every company is based on sales growth for products and services together with creating a positive image of the brand. Companies put a lot of effort into gaining new customers and building lasting relationships with them. They compete in enhancing their products, spend fortune on advertising and loyalty programs. But sometimes, as an old saying goes, the devil is in the detail. Today I will tell you something about these details, their importance in building positive relationships with your clients and simply (!) 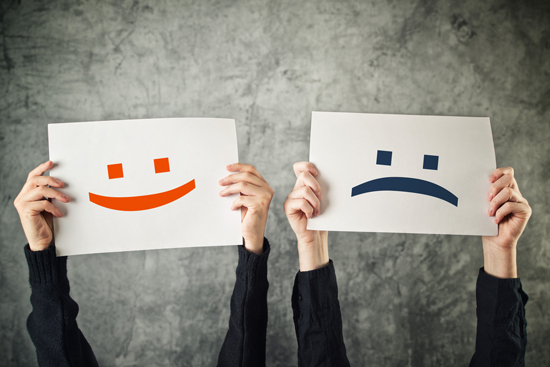 in building a positive customer experience. So ask yourself a few questions – How many times did you become prejudiced about a service, product or even a brand because of a “small thing”? Did it ever happen to you that you changed your mobile service provider because once when you wanted to verify your billing details you couldn’t find the necessary information at the invoice and when you run out of internet transfer during your holiday you couldn’t renew it because the helpline was busy? How many stores did you stop visiting because they don’t offer discounts or don’t accept returns or you were just treated in an impolite way there? At the same time how many times were you surprised by a nice gesture or encouraged to using a given service once again? Do you like the idea of cinema compartments or a free wi-fi on trains? Do you know these shops that have this nice smell of perfume while shopping or a coffee shop where friendly staff members remember your name? In our everyday choices between products and services each one of us is motivated by impressions and experiences we have with places, products and brands. The experience we gain as customers is often related to context, the situation we’re in. The example with running out of the internet transfer that was mentioned above will have a different effect on a teenager who is addicted to online gaming, downloading music and scrolling Facebook than on a businessman who cares about being in touch with his clients or a young mother who is strolling with her baby. So how can you use such situations to positively surprise your clients and invite them to use your offer? A very useful service design tool which enables us to discover how to improve customer experience is Customer Journey Map. What is a Customer Journey Map and what is it about? specifying a context and a situation in which the client decides to use company’s offer, determining the main need and aim of the client. Let’s see how a Customer Journey Map should be created by looking at examples below. We’ll check what is the experience of a client of a travel agency. I think that planning a family trip is close to all of us. You should start with defining a typical customer. Choose a representative of a typical client, give him or her a name, establish his or her aim, mission and imagine the context of a situation he or she is in (this is persona). More info you can find in our text – How to create a persona. In below examples we’ll find a mum who wants to organise a summer holiday trip for her family. Using your close surrounding add more details e.g. age, number of family members, interests etc. This will enable you to understand your customers and take a look at their needs with empathy. 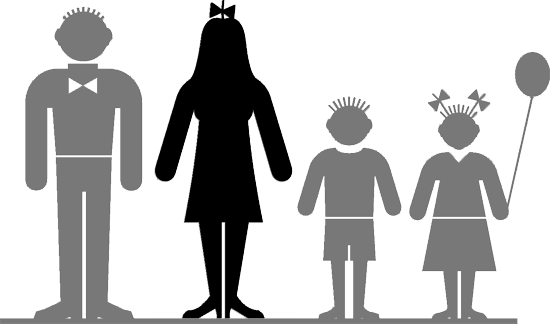 Looking from persona’s perspective – here it will be a mother chosen by us above – describe stages and steps that she has to take from the very beginning – the idea about the holiday trip – to its implementation – coming back from the trip. At this stage it’s important to look at a situation from a broad perspective. We should take a look at the whole context here: decision about going on a trip, gathering destination ideas for a trip, discussing with family etc. up to the return from the trip. This approach enables us to realise the whole spectrum of customer experience and understand possible obstacles. It depends on you how much you’ll go into detail while identifying these stages. Detailed approach is important but you should’t exaggerate with the number of stages. After describing stages of customer experience in detail we should establish the touchpoints our customer will have with our service. These touchpoints can be: a smartphone with an app for our service, computer and a website, employee of a travel agency, newsletter, leaflet distributed at the street, press, TV or Internet ads, friends’ recommendation. Every opportunity when our customer can get to know our service or use it (note: this step is skipped in the table but it’s helpful in selecting touchpoints which can be improved). We describe activities and needs of the customer at each stage e.g.. discussing a trip with family, going through magazines, searching for inspiration online, the need for help in choosing a destination or means of transport etc. Then, we identify customer’s expectations towards a travel agency at each stage. For example the mum would like to compare offers to choose the most attractive trip for adults and children. She would also like to make sure that the hotel will offer e.g.. vegetarian cuisine. Of course everything should be in best price. Finally it’s a time to answer the key question – what experience would our customer gain during his journey using our service? This evaluation and analysis should be approached honestly. Using the experience evaluation (we can use a three- or a five-level scale) we will get to know which stages of service use can be improved and how can we make our service more convenient and tailored to customers needs, attractive and encouraging for further use. 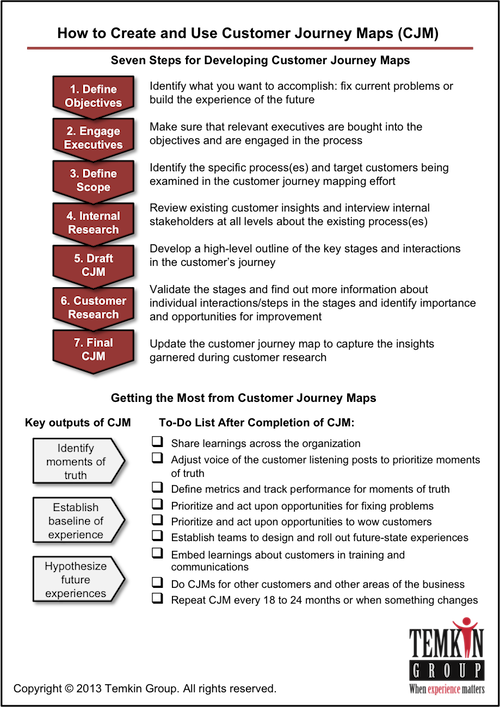 Writing these ideas down is the last – 7th Step in creating a Customer Journey Map. You can come back to this map whenever further project decisions are taken. It’s also worth to create new maps individually or with a team. Often after a while we start to see different details and discover other possibilities. I hope you liked this tool. In next blog entry we’ll present 10 best Customer Journey Maps in our opinion. We’ll also show you how differently they can be shaped.